Perfect for use on delivery vans, trucks or 18-wheelers, the Samson Radial Truck GL285T is a commercial tire specially designed to deliver excellent traction, a high carrying capacity and long-lasting wear life. Built with an advanced compound molded into an innovative tread design, the tire offers superior wear and gas mileage for road transportation, delivering versatility and stability on dry and wet roads throughout the life of the tire. Strong and durable, the Samson Radial Truck GL285T comes with a G (14 Ply) load range. 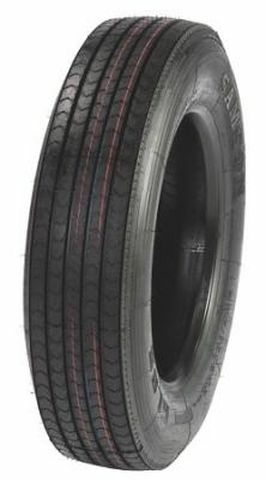 11/R-22.5 N/A 0 lbs 0 psi 0/32nds N/A 0" N/A 23"
Purchase includes the Samson Radial Truck GL285T tire only. The wheel rim shown in the picture is not included. Picture provided is a stock picture from the manufacturer and may or may not reflect the actual product being ordered. All Samson Radial Truck GL285T tires are continuously developing with manufactured improvements. With that said, Simple Tire and the manufacturers have the right to change these tire specifications at any time without notice or obligation. Please Note: Specifications of the Samson Radial Truck GL285T tires shown above are listed to be as accurate as possible based on the information provided to us by Samson tires. very pleased so far with these tires. only complaint is that i was to receive a gift card and didn"t.
Best tire for trailer ever By submitting a review, each person received a sweepstakes entry. Purchased these for my Take 3 car hauler. No issues at all. On this trailer I have 3 axles and on tight turns with a load with my 10 ply tires that came from factory I ran the risk of pulling the tire of the bead. Not so with these tires, they at heavy duty commercial tires and show no sign of sidewall flex during tight turns. By submitting a review, each person received a sweepstakes entry.